You'll be £12.99 closer to your next £10.00 credit when you purchase SS Peiper. What's this? On the night of 14 July, 1976 – Bastille Day – an elderly German was brutally murdered in a little French village where he had taken refuge from the evil shadow which had dogged him for the past thirty-two years. His killers were never brought to justice; indeed, no real attempt was ever made to track them down, the affair being politically embarrassing to both the French and the German governments. The murdered man was Jochen Peiper, once the dashing leader of one of the most renowned units in the German Army. The shadow which hung over him was his alleged complicity in the murder of over seventy unarmed American soldiers during the Ardennes offensive in the winter of 1944/45. It is certain that Peiper was not at the fateful crossroads near Malmédy at the time the men died, but that is not to say that they were not killed on his orders. Guilty or not, Peiper was tried and imprisoned after the war and on his release might have been said to have paid his debt for his supposed part in what had become known as the Malmédy Massacre. But there were those who thought otherwise. After exhaustive research, this classic work sees Charles Whiting tell the story of this enigmatic man, regarded by some as a brilliant and dashing leader of men, by others as a Nazi war criminal, with the vividness and punch which characterized Peiper's military career. All the facts may never be uncovered but all that are known are recorded here. What is certain is that Jochen Peiper remains one of the most controversial miltary figures to emerge from the maelstrom of the Second World War. Overall, the book offers great insights into how Peiper led his men on the battlefield and what motivations guided him till the very end. Besides the Nuremberg Trial proceedings with a particular focus on Peiper and the inherent complexity in confirming details of military crimes, the book contains inherent value in illustrating the combat prowess of the Leibstandarte. In the future, I would like to see more books that focus on Peiper’s key battles using not just arrow-filled maps but also isometric maps with illustrated drawings of tanks, vehicles, and infantrymen. A fair account of Jochen Peiper and his murder in France in 1976. The subject is a controversial figure because he was tried for war crimes released from prison and then many years later murdered. Highly Recommended. Author Charles Whiting, who died in 2007, was a respected historian and accomplished author. Most important of all, when it comes to works of this type, he was a dedicated researcher and, as such, has collected all known information relating to the life and death of Jochen Peiper in this excellent book. 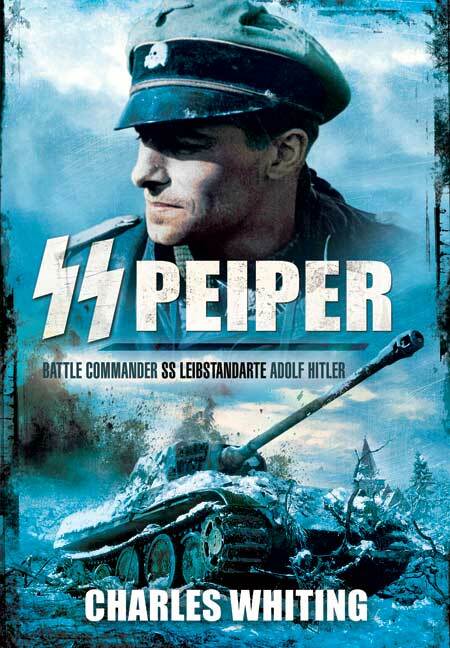 There is no doubt that Peiper was both a natural born leader of men and also a hardened Nazi. His eventual death, however, raised more questions than answers and, for that reason, the definitive truth is unlikely ever to be known. In December 1944 he was some 12 miles away from his unit when the men under his command executed some 70 American soldiers at Malmedy. At the resultant war crimes trial after the war, Peiper stood up an accepted responsibility for those murders and was initially sentenced to death - even though many Americans believed him to be completely innocent. Was Peiper responsible for those American deaths or was he simply demonstrating that fine quality of leadership by accepting the actions of his men as being his own? One could argue they were either obeying his standing orders or doing what they believed he would have done - were he present! Nobody was more surprised than Peiper himself to learn that his sentence was commuted to a period of imprisonment and he was eventually released from incarceration in 1957. Seeking a quiet life under an assumed name in an obscure village in France, he lived quietly with his wife and translated accounts about the war until his past was revealed by a vengeful local inhabitant. On Bastille day 1976, his house caught fire and his charred body was found amongst the ashes. Was this the long arm of those intent on seeking out and punishing all whom they perceived as former War Criminals - even if they had served their sentence? Or was it the drunken revelry of those who, celebrating France's most important day, had been reminded of her recent past and, knowing they had a convicted German war criminal in their midst, things simply got out of hand? In this work, Charles Whiting does take a rather sympathetic view of Peiper and, whilst that might run against the natural perception that all Nazis were bad and, therefore, deserved everything they got (not a view to which I subscribe! ), by taking this gentler approach, I believe Whiting presents a fair and balanced account of the life and death of someone who, in another army - serving a different cause, might have become one of the greatest leaders of all time. But then again, perhaps not. Peiper really is that enigmatic. Altogether, an excellent account, produced in a most readable style, and one which will get the reader thinking about Peiper in a balanced light.